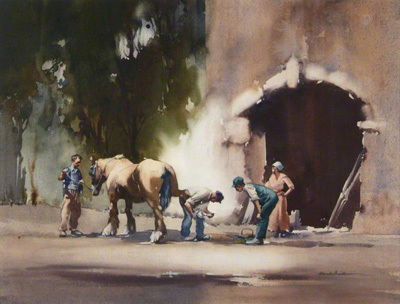 A water colour by the artist Claude Buckle showing the Smithy at work. One person is holding the horse while the owner looks on. A women is observing the work. The artwork of the horse and people in this picture are exceptionally good and realistic. Location somewhere in France Created in 1970.